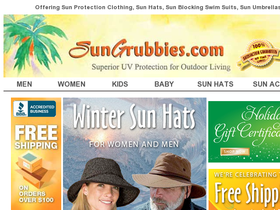 At SunGrubbies.com you'll find absolutely everything you need to protect you from harmful UV rays. Sun Grubbies carries women's, men's and children's SPF clothing as well as golf attire. Sun Grubbies goal is to offer you quality sun protection products with exceptional customer service while caring for your personal sun protection needs. Save on your next purchase from SunGrubbies.com with discounts, coupons and savings from 58coupons.com. Check out SunGrubbies.com and save up to 20% on select children's items! Click link and get the sun protection your child needs. Enjoy free shipping on your order over $100 or more from SunGrubbies.com. Click link to start shopping. Shop SunGrubbies.com and enjoy select skin care products at 10% off! Click link and see what's on sale. Go to SunGrubbies.com and purchase 5 protective paint-your-own hats and save 20%! Click link for this great deal for the whole family.